Has Mike Trout Already Peaked? Mike Trout has put up an amazing couple of seasons in Major League Baseball, not just for someone as young as he is, 22, but for anyone. His 19.62 wins above replacement (WAR) over his first two full seasons ranks as the 36th best two-year stretch for any batter ever. Only nine batters have had a better stretch by the age of 25, and they’re essentially a who’s who of Hall of Famers: Mickey Mantle, Babe Ruth, Ted Williams, Ty Cobb, Lou Gehrig, Rogers Hornsby, Eddie Collins, Jimmie Foxx and Willie Mays. The list of players who put up better numbers at an earlier age doesn’t have any names on it. Conventional wisdom seems to be that Trout, an outfielder for the Los Angeles Angels of Anaheim, is only going to get better. 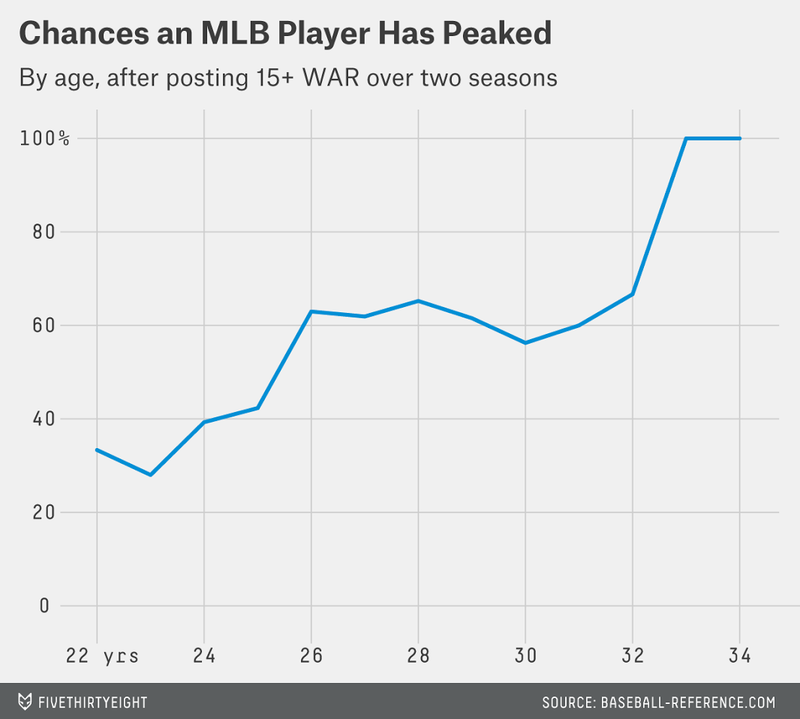 Much of that analysis relies explicitly on the traditional aging curve or on similar logic: MLB players and prospects typically improve rapidly through their late teens and early 20s, peaking around age 27. Trout was 21 last season, ergo, he has several years of improvement in his future. But regression to the mean dictates that the better the performance you’re looking at, the less likely it is to be duplicated. Players who put up huge numbers like Trout’s (or anywhere close) this early in their careers have a very high likelihood of having All Star- and/or Hall of Fame-quality careers. But how often do they improve on these initial breakout performances? I’ve taken all the players who put up more than 15 WAR over a two-year period at any point in their careers and broken them down by the age when they first accomplished the feat. Then I asked a simple question: Did they ever manage a better two-year period? The size of the bubbles represent how many players accomplished the “15 WAR in two years” milestone, and the y value of the bubbles show the percentage of those players who surpassed that milestone. 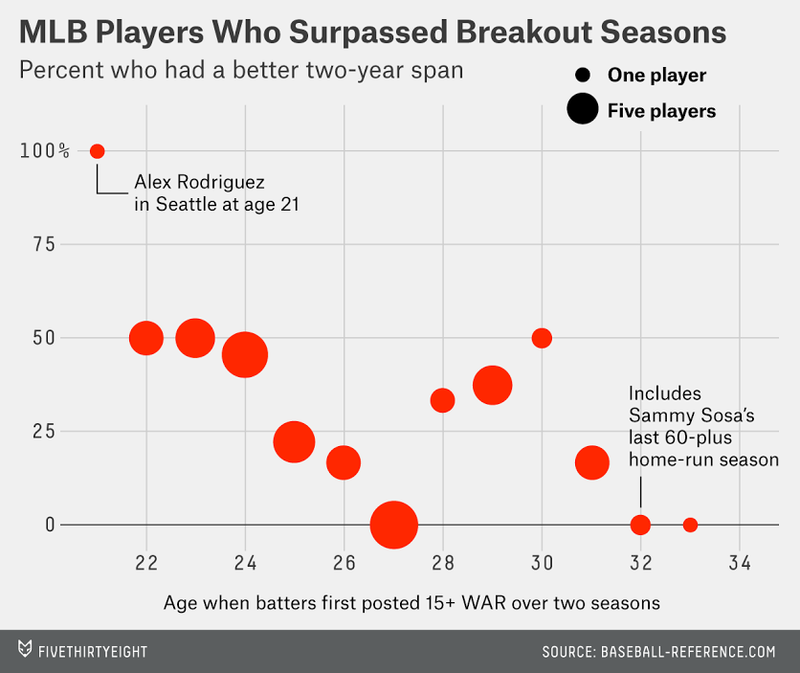 As you can see, the odds of someone Trout’s age improving are ostensibly 100 percent, but that bubble represents a single data point: Alex Rodriguez. If you move to the much larger group of players between ages 22 and 24, the odds drop into the 50 percent range. On the other hand, some players who never managed a stronger two-year stretch still managed a strong third season immediately after their initial two-year breakout. In such cases, they may set a new two-year “peak” that overlaps the original. Thus, while never replicating their original two-year performance, they end up with a better two years on the books. This is the most likely time for a player to establish a new “peak,” because pulling it off only takes one well-timed season instead of two. Cutting both ways: Trout’s numbers are higher than average in his age group. This makes it more likely that he’s a uniquely great player, but it also makes the numbers inherently less likely to be surpassed. Cutting in his favor: Trout was 21 last season, and his group covers players age 21 to 23. This gives him a slightly longer career ahead, and thus more chances to put up better seasons. Further, having pulled off such great numbers at such an early age probably increases the chances that he’s truly special. But there’s not really enough data to demonstrate this effect. Cutting against him: Trout is probably less likely to achieve a new two-year peak this year, because the strongest of the two seasons in this run was the first. Improving on his peak will require him posting better than 10.8 WAR — a feat which has happened only 22 times before, six of which were by Babe Ruth. (Also, though outside the scope of this post, it’s possible that the aging curve is no longer as favorable as it used to be). All things considered, the answer to whether Trout has peaked yet is “probably not,” though I think it’s far from being as much of a certainty as many people seem to think. Even some of the Hall of Famers mentioned above peaked early, and Trout’s start has been so strong that he could potentially do the same and still end up joining them.